London is one of the most popular tourist destinations in the world - be prepared for the crowds. It’s also known for its rainy and misty days, so bring an umbrella. Winter time is cold so make sure to pack warm clothes. It’s a popular time to visit London because of the holiday decorations and busy shoppers. 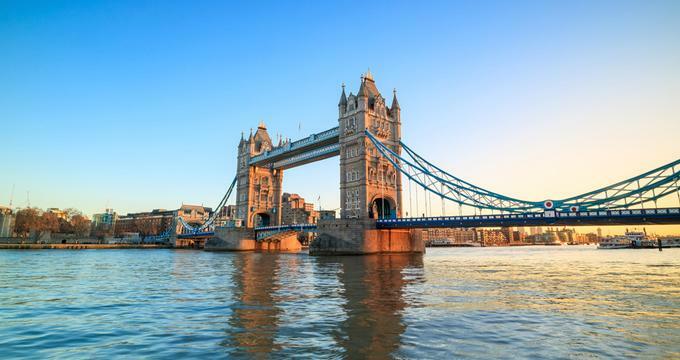 Summer is not necessarily the best time to visit London: schools have breaks so the city is extra-crowded; airfares and hotel room rates are high; and if you’re expecting sunny warm weather, you might be disappointed. The spring is the best time to visit London because the crowds have not yet arrived; the weather is cool but not cold; and the flowers are blooming. London Weather in January: January is the coldest month of the year for London. The new year brings with it a chilly low temperature average of 41°F (5°C) and cool high temperature averages of 48°F (9°C). February sees both the average high and average low temperatures remain the same. The cold temperatures are matched by a low daily average of sunshine of 4 hours per day. In March, the average high temperature increases by a sizeable margin to 54°F (12°C). The average low temperature also increases by a few degrees to 43°F (6°C). Meanwhile, the precipitation average is 35 mm making March the driest month of the year in London. April’s climate warms further for spring time in London. The low temperature and high temperatures are 45°F (7°C) and 59°F (15°C) respectively. London Weather in May: Temperatures remain mild in May despite increasing quite a handful to 50°F (10°C) for an average low temperature and 64°F (18°C) for an average high temperature. Expected rainfall is May is 50 mm. In June, vacationers can expect nice and sunny days with 8 hours of daily average sunshine. The high temperature climbs to 70°F (21°C) while the low temperature increases by 5 degrees to 55°F (13°C). July is the hottest month of the year in London with an average high temperature of 73°F (23°C). The average low temperature is 59°F (15°C). In August, the high and low temperatures remain exactly the same thus tying with July as the hottest month of the year. London Weather in September: Fall descends on London in September bringing with it about 49 mm of light rain showers. The average high temperature decreases to 68°F (20°C) while the average low temperature drops a few degrees to 55°F (13°C). October receives the most rainfall of the year with an average precipitation rate of 71 mm. The high temperature averages and low temperature averages range between 61°F (16°C) and 50°F (10°C). In November, the days seem quite short with only 3 hours for the daily sunshine average. The average high temperature decreases to 54°F (12°C). Meanwhile, the average low temperature drops by 5 degrees to 45°F (7°C). December sees another drop in the climate with the high temperature average and the low temperature average at 48°F (9°C) and 41°F (5°C) respectively. Precipitation rates average at 53 mm. London in a magical city to visit no matter what time in the year, but just like any city there are certain aspects that stand out depending on your time of visit. For the travelers who are sensitive to weather, the best time to visit is during spring months of March to May when the temperatures are mild. The best time to explore the royal parks and blossoming gardens is in April when spring is at its peak. For some of the best historical events in London, the best time to visit is during November to catch the Lord Mayor’s Show and Guy Fawkes Night. Lovers of cold weather will thrive in London between December to February when the snow blankets the city and the skyline sparked with festive, twinkling lights. London has more than one airport. Heathrow is the busiest airport in Europe: it is located about 17 miles west of the city and most international flights arrive at this massive airport. The other London area airports are City Airport, Gatwick Airport, London Southend Airport, Luton Airport, and Stansted Airport. Most of these connect London with cities in Europe. Arriving by the Eurostar from the continent is easy because the trains leave and arrive at stations in the center of the cities. There are buses that travel from the continent using a ferry to cross the English Channel to London. This is an inexpensive way to get to London. With so many airports, it’s no surprise that there are so many ways to get into London. The Easybus company provides service between Gatwick, Stansted and Luton airports and London, while Greenline buses run between Heathrow, Luton and Stansted to London. 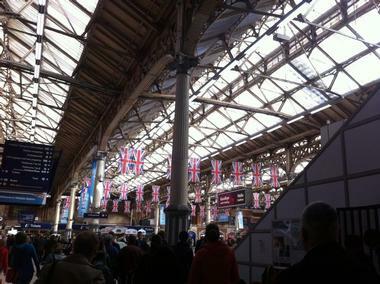 There are express trains from Gatwick, Heathrow, and Stansted. 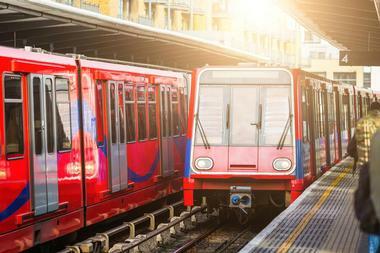 Visitors can use London’s underground subway system, the Tube, to get from Heathrow and London City into London. Car rental agencies are located at the airports, but driving in London can be a nightmare. There are shuttles that will accommodate up to eight people for the ride into the city. There are also chauffeur services and taxis. 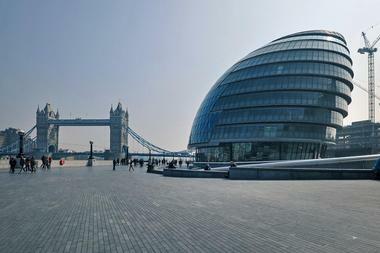 There are visitor information centers spread throughout London, especially in the popular tourist areas. Professionally trained multilingual staff can help visitors understand this enormous city and help them with their questions such as what to see and do, how to get around the city, where to shop, where to eat, and where to stay. Staff can help visitors plan itineraries to accommodate each visitor’s needs and wants. They can also recommend guided tours such as city walks and others. 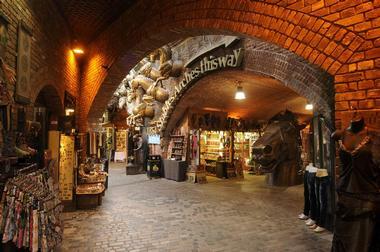 At these visitor information centers, visitors can buy fast-track tickets to London attractions. You can even exchange currency at some of the visitor information centers. 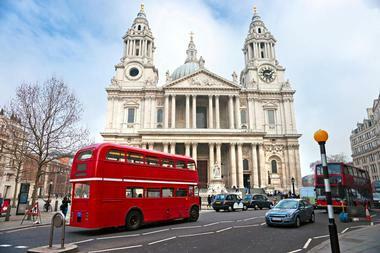 London is famous for its bright red double-decker buses. They are a quick and inexpensive way to get around the city and do some sightseeing at the same time. In addition to single fares, you can buy a variety of bus passes including seven day, one month, and one year. One of the best and most fun ways to get around London is to take advantage of its world famous river, the Thames. There are amazing views from the boats that are operated by the London River Bus Services on the Thames. Not only is it a fun way to get around, but it is also fast with frequent but quick stops along the way. The London Underground rail system is usually called “The Tube.” It is a great way to get around London, and many tourists use this convenient system. Stations are easily recognized by their white circle surrounded by a red ring, with the name of the station in blue across the circle. There are 12 Tube lines which are divided into 9 travel zones. Zone 1 is in the center of the city while zones 6 to 9 are on the outskirts of London. There are single fares as well as a variety of passes. There are also discounts for children, students, and the elderly. Free maps of the system are available at any Tube station. 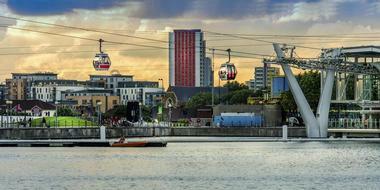 The Docklands Light Railway is a driverless system that provides service to parts of East and South East London. It serves London City Airport and connects with the Tube at several stations: it also stops at non-Tube stations. There are individual fares as well as passes. Apart from this system, there are overground local trains in London that not only cross the city but also take passengers to areas not serviced by the Tube. Made up of six lines, these local trains connect with the Tube at various stations. Tramlink is the name of London’s tram system that runs in South London. Trams run every ten minutes during the day. 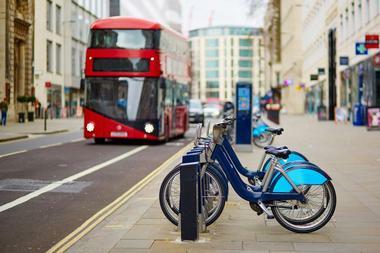 Biking around London is a fun and popular way to see the city’s attractions. Officially called Barclays Cycle Hire, they are more often called “Boris Bikes.” This is London’s public bicycle program. The first half hour is free: if you park it in a docking station before your half hour is up, and then wait five minutes, you can pull out another bike and ride it for free for a half an hour. Most people pay the daily or weekly fee which gives them the freedom to ride and see the attractions and not pay attention to the time. One out of four Londoners uses a bike to commute to work. Driving a car in London can be extremely challenging: fuel prices are exorbitant, parking is scarce, and traffic is often congested. You can find London’s famous black cabs all over the city especially at hotels, airports, and busy train stations. An illuminated sign on top of the taxi means that it is available. While Greater London cannot be seen on foot, Central London can: it is probably the best and cheapest way to see the major attractions. The Thames Clippers is a fleet of fast catamarans that run every 20 minutes. Emirates Air Line Cable Car takes passengers above the Thames with great views from the Greenwich Peninsula to the Royal Docks. 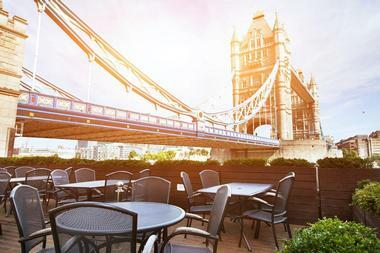 London is one of the best dining cities in the world. There are fine dining restaurants, pubs, cafes, bistros, and eateries serving ethnic cuisine from all around the world. Young chefs have revamped old pubs and serve top cuisine at reasonable prices. These gastropubs are found not just in the center of London but also in many residential neighborhoods. There is also a shift from West London to East London where many new restaurants and cafes have opened. There are many restaurants close to theaters and other venues in Covent Garden, Leicester Square, Piccadilly Circus, Soho, and the Strand. Many of the restaurants serving ethnic cuisine are affordable. As a huge city, London has numerous places for shoppers to explore. Oxford Street is the heart of London shopping: there are more than 300 shops as well as landmark stores and designer outlets. Not far from Oxford Street is Carnaby Street that features 150 brands and more than 70 restaurants and bars. It is also home to Selfridges, Debenhams, and John Lewis department stores. Regent Street is an elegant area with mid-priced clothes while Jermyn Street is known for its many clothing stores. Luxury stores are found on Bond Street and Mayfair. There are two large shopping malls in London’s Westfield: they are White City and Stratford. London is approximately 610 square miles in size and it is made up of many neighborhoods. The City of London is only one square mile and is the home of London’s financial district, St. Paul’s Cathedral, and Lloyd’s of London. Fleet Street is nearby. Westminster is where many visitors head: here they can see Buckingham Palace, Westminster Abbey, the Houses of Parliament and Big Ben, the National Gallery, and Trafalgar Square. 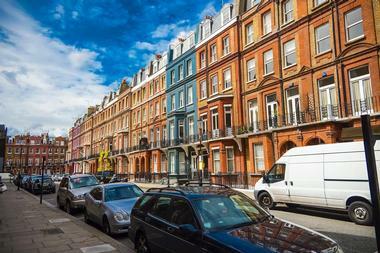 Kensington is a wealthy and upscale neighborhood: Chelsea and Notting Hill are nearby. Leicester is a cobblestone pedestrian square that is London’s West End Theater District. Piccadilly Circus is often compared to New York City’s Times Square. Regent’s Park is where the London Zoo is located. 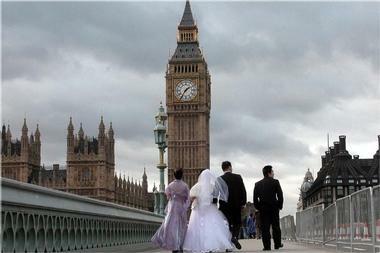 The spring and summer are the most popular times to get married in London. The city’s parks and gardens are blooming with color and the trees have come to life. Hotel wedding venues include the Andaz Liverpool Street Hotel, the Connaught Hotel, the Antoinette Hotel, St. Ermin’s Hotel, the Trafalgar Hotel, and many more. Pembroke Lodge’s terrace called The Belvedere has stunning views of the Thames Valley to the West. Spencer House is a historic private 18th century house decorated with beautiful works of art. Some unusual wedding venues include Shakespeare’s Globe, the Trafalgar Tavern, and Le Gothique Restaurant and Bar with its gargoyles, towers, and turrets. As an enormous city, London offers a wide range of accommodations. Visitors often choose hotels in the West End or the South Bank: this makes it easy to walk to attractions. For museum lovers, West London is best. 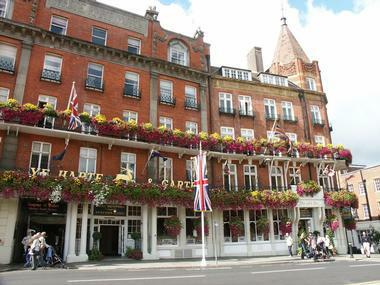 Luxury hotel accommodations include the 41 Hotel, the Bulgari Hotel London, the Cafe Royal, the Corinthia Hotel London, the Egerton House Hotel, the Four Seasons Hotel London, and many more. Boutique hotels are like bed and breakfasts but offer all the facilities of bigger hotels. There are also bed and breakfasts, inns, rental apartments, and self-catering accommodations. Uptown Reservations offers stylish furnished rooms and suites in private homes. There are many affordable hotels in North London.